A customer recently tried to restore a Dynamics AX database backup from the Live system to the Testing environment. 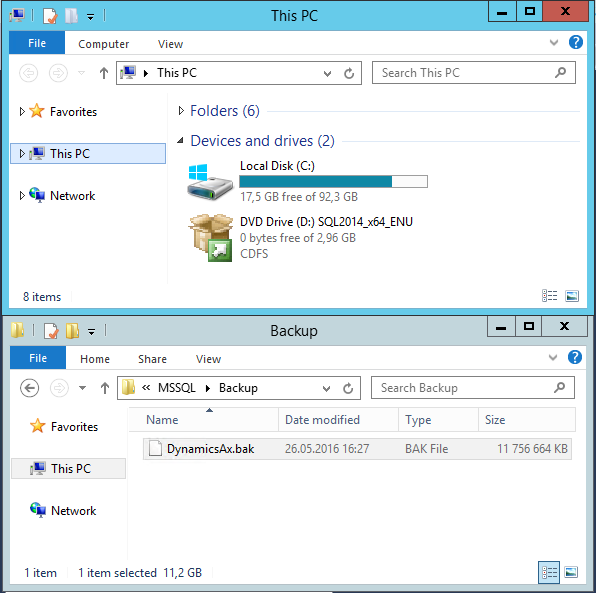 The SQL Server data disk had 17 GB space left, and the size of database backup (.bak) file was about 11 GB. However, SQL Server refused to restore the database because of insufficient free space. The reason was the file layout in the original Database. Typically, the database files and log files pre-allocate space to avoid costly file operations when the content of the database grows. In this case, the database file had 20 GB space and the log although the content of the database was only about 11 GB. When a backup is created, SQL only backups the content of the files and adds additional information about the file layout. When the database is restored, the database files will be allocated like in the source database. Therefore 21 GB were needed but not available on disk. The solution was to increase the storage on the Test system, restore the database and afterwards shrink the database file.